Located on Croatia’s Dalmatian coast, the historic city of Sibenik is a gateway to some of the country’s most beautiful spots. The city is around 10 kilometres away from Krka National Park, and only a 2-hour drive from the spectacular Plitvice Lakes National Park. Sibenik boasts a charming stone walled old town as well as 4 imposing fortresses – one of which is 1 of the city’s 2 UNESCO World Heritage Sites. The city’s historic sites have even seen it featured in a number of episodes of the well-loved Game of Thrones TV show. In recent years, Sibenik has made use of EU funding to renovate a number of sites, in order to attract more tourists to the area. Despite this, the city isn’t too crowded just yet – so make sure to add it to your Croatia itinerary so you can visit before everyone else starts to. If you’re looking for hotels in Sibenik, make sure to check out our article on the best places to stay in Sibenik or head to Agoda for great deals on accommodation. 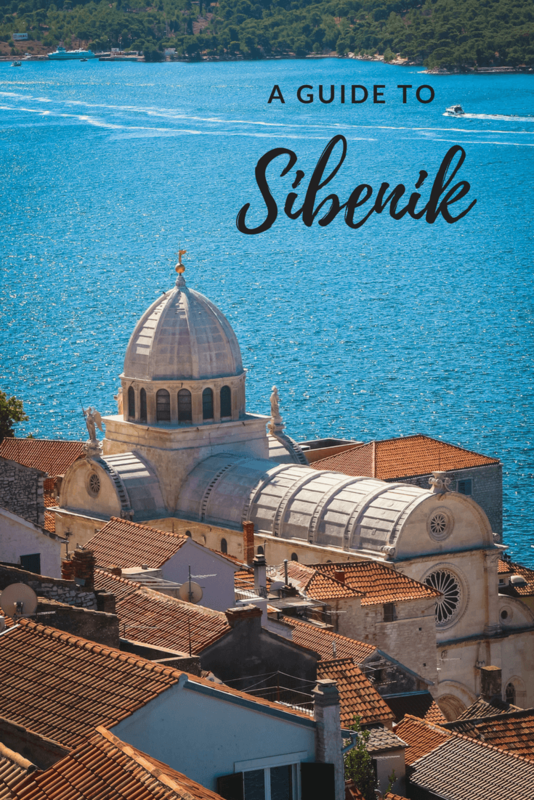 Otherwise, everything you need to know is covered in this Sibenik guide. Flight – The closest major airport to Sibenik is Split airport, which is located around 56 kilometres away. 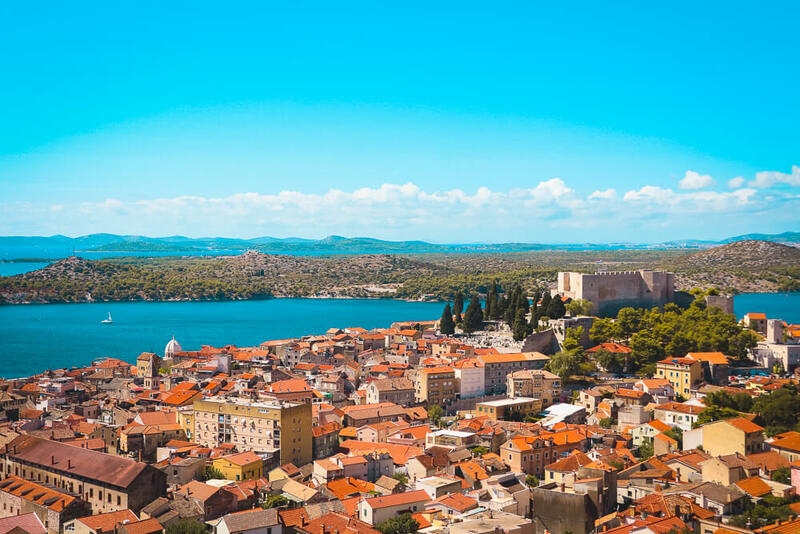 If flights to Split are pricey for your preferred dates, you may have more luck with flights to Zadar Airport – which is 80 kilometres away from Sibenik. We recommend using Momondo to book flights as they find the cheapest flights for you and save you all the hard work. Click here to find the best flight prices for your dates on Momondo. Upon arrival at either airport, your best option for getting to Sibenik is to rent a car and drive. It’s best to have this arranged in advance so you don’t need to worry about it when you land. Click here to get a car rental quote for your trip. The other option is to travel by bus from the airport to Trogir and then catch a bus onwards to Sibenik. Buses to Trogir cost 13 Kuna, and run from just outside the airport car park every 20-30 minutes. Click here for a map showing exactly where the bus stop is. Buses from Trogir to Sibenik cost around 34-40 Kuna depending on which service you pick. Click here for the timetable and to book tickets in advance. Bus – Intercity buses are a convenient way to get around Croatia. Wherever you are in the country, you’ll be able to reach Sibenik by bus. Click here to search routes and buy tickets to Sibenik from all over Croatia. Sibenik itself is a relatively small city, making it possible to walk between the city centre’s main sights. That being said, we strongly recommend renting a car. It’s the best way to explore the surrounding areas – from national parks to historic towns. You’ll end up saving a lot of money if you drive between attractions as opposed to paying for tours, and it also gives you the freedom to work to your own schedule. This is particularly useful if you want to arrive early and avoid the crowds at Krka and Plitvice National Parks. The weather in Sibenik, and Croatia in general, is best between June and August as these are the hottest months and have the least rain. As is to be expected though, this is the busiest time of year in Sibenik, so it can be harder to get a good deal on accommodation. For those wanting to avoid the tourist crowds, the weather is still reasonable in both May and September. You may have a few rainy days but, unless you’re extremely unlucky, it shouldn’t be too bad. If you’re not worried about cooler weather and rain, Sibenik is a lovely city to visit all year round. The advantage of visiting in the colder months is that the attractions will be a lot quieter so you won’t have to share them with as many other people! Fortresses – Sibenik is known for its fortresses, and for good reason – the city boasts 4 of them. 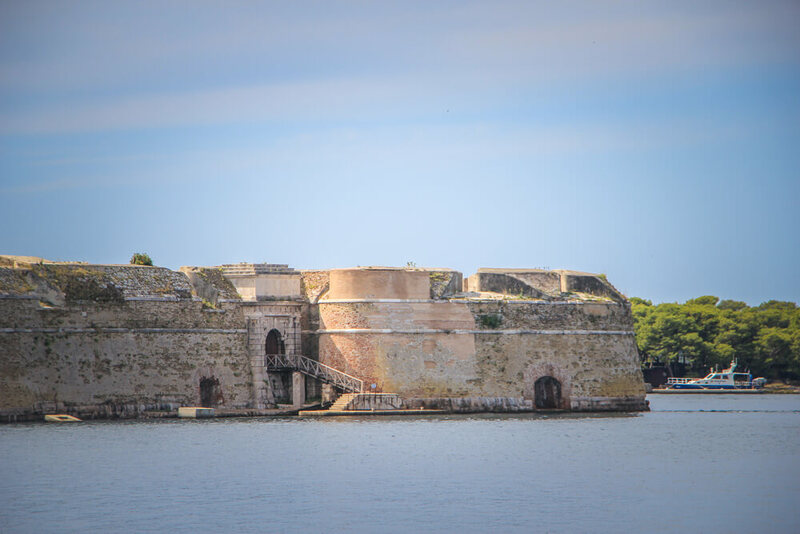 Particularly impressive is the St. Nicholas’ fortress, which was built at sea with only a narrow path linking it to the mainland. This 16th century fortress was declared as a UNESCO site in 2017, but there is currently no official entrance fee. If you wish to go inside you’ll either need to visit by boat and go in via the main entrance, or alternatively via land you’ll need to climb a sturdy wooden plank and enter via a window. For the second option you’ll need some strength and a sense of adventure! To visit Barone fortress and St. Michael’s fortress, you can buy a combined ticket for 50 Kuna, which gives you entry to both. Barone fortress is 80 metres above the city and offers brilliant panoramic views. In contrast, St. Michael’s fortress is located right beside the Adriatic Sea and is the oldest monument in Sibenik. From here you get brilliant views of St. James’ Cathedral and orange tiled roofs – similar to those found in Dubrovnik. Personally we preferred the view from Barone fortress, but it’s well worth visiting St Michael’s as well! St. John’s fortress will be of particular interest to Game of Thrones fans as some of the show was filmed here. The fortress itself is undergoing renovation, which is due to be completed in September 2019. Due to its location 115 metres above the city it offers brilliant views. Currently there is no entry fee to visit St. John’s fortress, however this will most likely change once the renovation is completed. Krka National Park –One of the best things about staying in Sibenik is its proximity to the beautiful Krka National Park. Covering over 100 square kilometres, the park is home to numerous waterfalls, making it an extremely popular place to visit. The park’s most famous attraction is the majestic Skradinski buk waterfall. What makes this a particularly great spot is that you can swim in the cool yet refreshing water of the falls. Unsurprisingly it can get extremely crowded, so arrive early if you want to have this naturally beautiful spot to yourself. Our other two favourite spots in the park were Visovac island and Manojlovac slap waterfall. The tiny island of Visovac is home to a monastery first established in 1445, making it a particularly picturesque spot amongst the surrounding nature. Manojlovac slap is the tallest waterfall in Krka National Park and is surrounded by lovely scenery. Despite this, the waterfall is less visited and a lot quieter than Skradinski buk, but we think it’s well worth the drive! 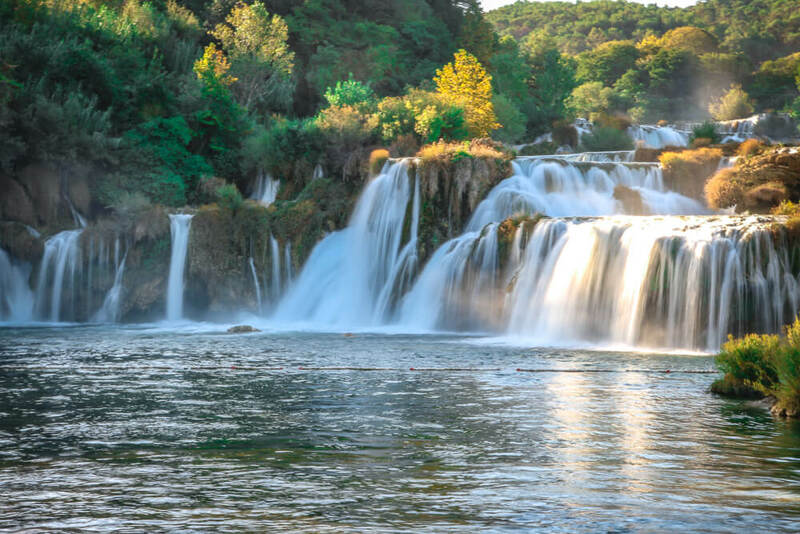 The entrance price to Krka varies from 30 to 200 Kuna depending on what time of year you visit. Click here to find out the different prices. Explore the Old Town – Sibenik’s old town is a perfect place to pass a few hours simply by wandering around the narrow cobblestone streets. The countless stone walled buildings give Sibenik a charm that you can’t help but enjoy. It can be a bit of a maze to navigate through, but even if you get lost you’ll find yourself enjoying the city’s historic streets. The most famous attraction in Sibenik, St. James’ cathedral, is found in the old town. Constructed entirely from stone, the cathedral is considered the Dalmatian coasts’ architectural masterpiece – earning its place on the UNESCO World Heritage list. The cathedral’s dome towers above surrounding buildings, making it visible from many viewpoints across the city. If you wish to admire the Sibenik cathedral from the inside as well, there is an entrance fee of 25 Kuna. Just outside the old town there’s a statue of Croatian King Petar Krešimir IV, who it is claimed is the founder of Sibenik – the oldest native Croatian town. The first mention of Sibenik in history came in 1066, during King Petar’s rule. 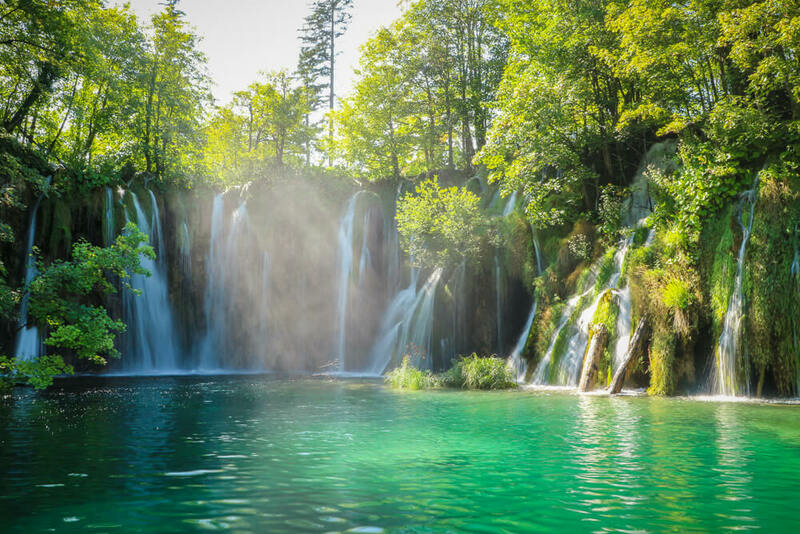 Plitvice Lakes National Park – Perhaps the most naturally beautiful spot in all of Croatia, Plitvice Lakes National Park is home to 16 interconnected lakes and over 90 waterfalls. Found amidst vast woodland, the lakes are an enchanting turquoise colour with crystal clear waters, which gives a fairy tale feel to the park. With walking trails throughout, it’s easy to spend the whole day getting lost in Plitvice’s breath-taking nature. Although Plitvice is almost 200 kilometres away from Sibenik, it’s possible to drive there in around 2 hours. It may seem like a long trip, but it’s one that is definitely worth it. Entrance costs between 55 and 250 Kuna depending on the time of year you visit. Click here for full pricing information. Haed to the beach – Although Sibenik shouldn’t be your first choice if you’re looking for a beach holiday, there are still some beaches to enjoy nearby. The city itself has a small pebble beach with views of the old city, but for the area’s best beaches you’ll need to head further afield. For everything you need to know about beaches near to Sibenik, check out this article by Croatia Expert. Day trips – Sibenik is well located if you’re hoping to explore more of Croatia. There are a number of places nearby well worth exploring as part of a day trip, such as Split, Trogir, Skradin and Zadar. Split is famous for the impressive Roman ruins of Diocletian’s Palace. The name is slightly misleading though, as it isn’t actually a palace. Instead it makes up around half of Split’s old town and is home to bustling streets, restaurants and bars. 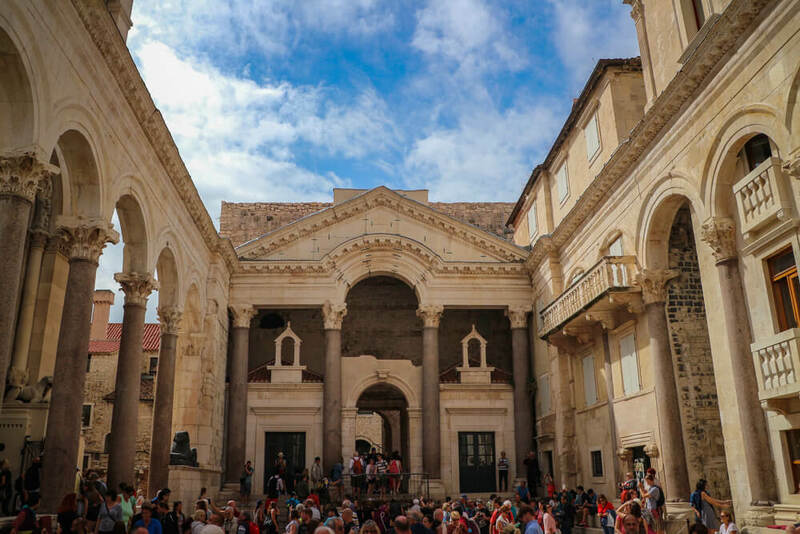 It’s definitely worth a visit when in Sibenik, and there’s plenty more to it than just the palace – check out this article featuring 15 things to do in Split. 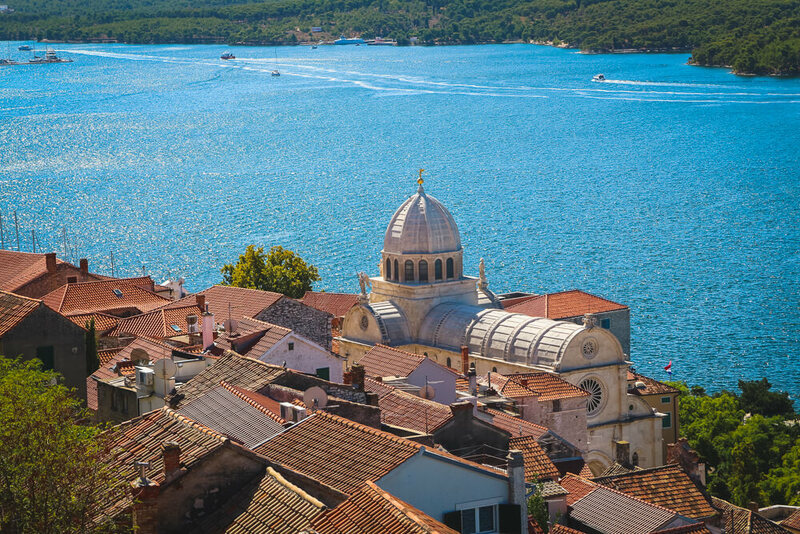 The UNESCO World Heritage site of Trogir is another example of one of Croatia’s many beautiful old towns. With well preserved Romanesque and Renaissance architecture, it’s a great spot to combine with a day trip to Split – which is just 30 kilometres away. Just 20 kilometres away from Sibenik, lies the pleasant town of Skradin. Many people only visit as there is an entrance to Krka National Park here, but it’s a nice place to visit in its own right. There’s a lovely viewpoint of the area from Turina Fortress if you’re happy to take the relatively short walk up. Our final recommendation for a day trip is to the city of Zadar – around 90 kilometres away from Sibenik. Zadar is home to a number of Roman and Venetian ruins, which make up the city’s old town. On top of this, there are some more recent quirky additions to the city. Along the waterfront is the world’s first sea organ, which plays musical notes generated from the power of waves below. Next to the sea organ lies the unique art installation the Greeting to the Sun. 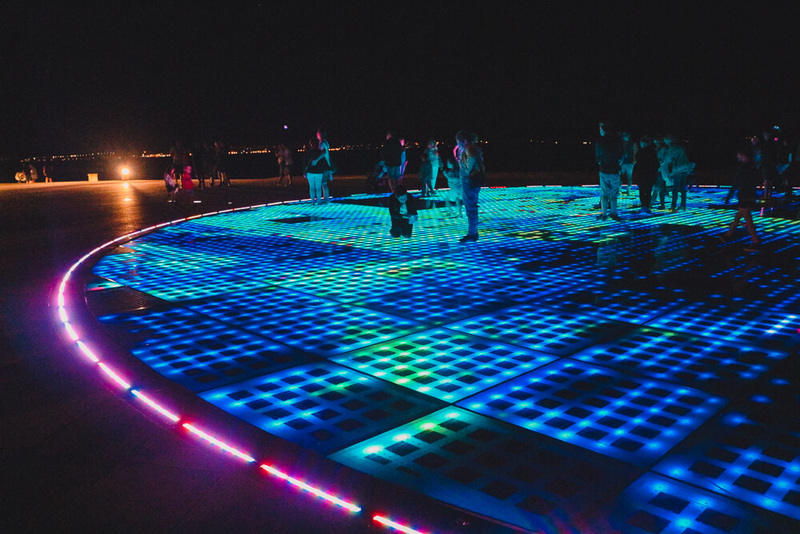 This large circle, 22 metres in diameter, absorbs energy from the sun throughout the day and performs a magical, colourful display come nightfall. Restaurant More – With friendly service and great food, Restaurant More is a must visit when in Sibenik. Located on the waterfront, it’s a great place to enjoy a meal after watching the sunset. The menu is packed with plenty of options for everyone. If you like seafood then this is the place to come, with a number of tasty options available including an impressive seafood sharing platter. We couldn’t help but come back multiple times throughout our stay. Konoba Nostalgija – Although Konoba Nostalgija one of the more expensive restaurants in Sibenik, the quality of the food makes it well worth a visit. While the menu isn’t huge, there’s still plenty of choice available – from meats to salads. Our personal favourites were seafood and pasta dishes, but whatever you opt for you’re sure to enjoy it! Konoba Dalmatino – With outside seating in one of the cobblestone streets of Sibenik’s old town, Konoba Dalmatino offers meals in a lovely setting. Prices are extremely reasonable with fish and meats being particularly good choices from the menu. Like this Sibenik Guide? Pin it!